How Not to Worry (2012) is a practical and accessible roadmap to defeating anxiety, stress and worry. 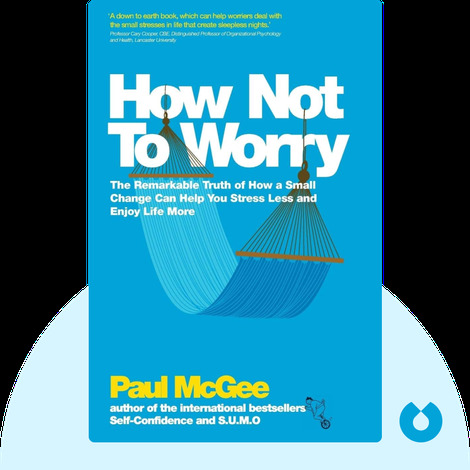 Logical and clearly laid out, life coach Paul McGee’s approach is all about small changes that make a big difference. He shows that by thinking analytically, you can start dealing with worries rationally and free up valuable headspace for more pleasurable pursuits. Paul McGee is one of the UK’s leading motivational speakers. He has written seven books and lectured on topics ranging from workplace dynamics to stress management and confidence in 35 countries. McGee is also the founder of Shut Up, Move On (SUMO), a life-coaching program which draws on cognitive behavioral therapy. © Paul McGee: How Not To Worry copyright 2012, John Wiley & Sons Inc. Used by permission of John Wiley & Sons Inc. and shall not be made available to any unauthorized third parties.